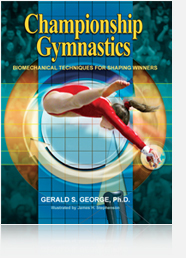 Dr. Gerald George's NEW Book Championship Gymnastics: Biomechanical Techniques for Shaping Winners is available now! Championship Gymnastics represents an entirely new approach to the study and understanding of gymnastics movement. It is the only textbook on the market that bridges the gap between theory and practice. Whether you are a gymnastics performer, teacher, coach, or even a judge, this textbook seamlessly weaves together the “science” of biomechanics with the “art” of gymnastics movement. Aside from the highly acclaimed Biomechanics of Women’s Gymnastics published in 1980 (authored by Dr. George), Championship Gymnastics is the only textbook in gymnastics that bridges the gap between theory and practice. Its breadth and depth of content are sufficiently complete to eclipse that of any competing gymnastics book in the world. 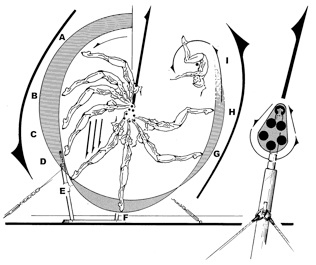 In Chapter 1, the concept of “ideal modeling” is introduced as a unique tool for shaping movement potential in gymnastics skills. Ten basic factors affecting success in gymnastics are introduced from the practical applications perspective. Chapter 2 presents five unique conceptual principles that can and should be employed to identify, refine and ultimately maximize gymnastics skill execution. Chapter 3 (the handstand) demonstrates and emphasizes that proper mechanics and training of the handstand is the common denominator to successful learning of all gymnastics skills. 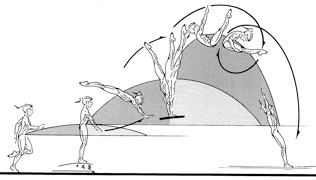 Chapter 7 (patterns of motion) covers the entire spectrum of core movement patterns in gymnastics. Innovative, yet easy-to-understand, concepts for mastering body shape inform readers of “what constitutes correct movement patterns and why.” And Chapter 8 (concepts of training) provides a clear and compelling training overview that explains “how to get there.” Rather than recommending specific training protocols, readers are guided through an understanding of the underlying principles for achieving high levels of flexibility and power. Armed with this perspective, gymnasts and coaches can design training programs that are specific to the unique needs of each individual performer. 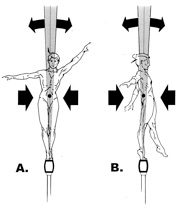 The remaining Chapters 9, 10, 11 and 12, apply these movement concepts to each of the four Olympic events for women (floor exercise, balance beam, vault, and uneven bars). Each chapter carefully explains and accurately illustrates critical movement components that separate the champion from the would-be champion.